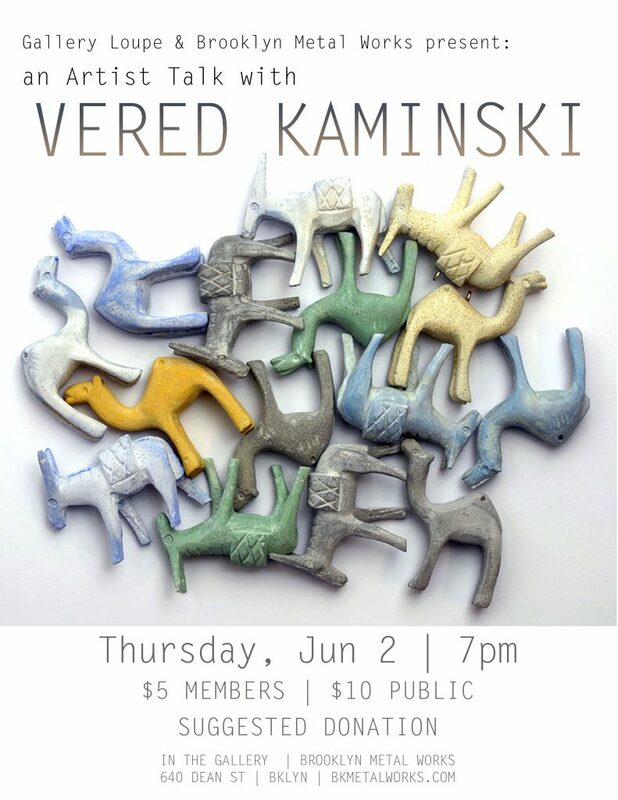 Please join us In the Gallery at Brooklyn Metal Works for an artist talk with Vered Kaminski on June 2 at 7pm. Kaminski, one of Israel’s most prominent artist-jewelers, was awarded the 2014 Andy Prize for Contemporary Crafts, which included a solo exhibition at the Tel Aviv Museum of Art, and accompanying catalog. Her latest pieces explore rocks – both natural and artificial – with which Kaminski makes brooches and pendants featuring “stones” of cement, sand, pigment and glue, as well as actual stones, or some combination of both. Due to her exemplary craftsmanship, these fissured rock formations – whether real or fabricated – appear interchangeable. Process is the entry point to understanding Kaminski’s practice. She delights in detail and often follows a mathematical approach to jewelry-making. Kaminski employs the meditative aspects of repetition to create delicately intricate structures that feature meandering wire lines and/or myriad forms found in her homeland, for which she utilizes diverse materials – both precious and plain. The pieces often have architectural associations, such as fencing, or ornamental connections that sometimes channel Islamic tracery, as a way of acknowledging her Palestinian neighbors. Vered Kaminski is visiting from Israel in support of her upcoming solo exhibition “Sand In A Bottle” at Gallery Loupe. This show is comprised of selections from the “Artificial Stones” exhibition held at the Tel Aviv Museum of Art in 2015, and will open with a reception at Gallery Loupe on June 4 from 6-8 pm.